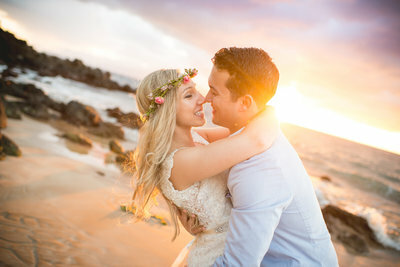 There was a sweet spirit at Grace and Gabriel’s Maui Beach Wedding! The bride’s father passed away 2 years ago but was present in spirit. Her little brother even held a framed photo of their dad as he walked his sister down the aisle. This was a truly touching moment to witness and one we are positive Grace and Gabriel will remember for the rest of their lives! 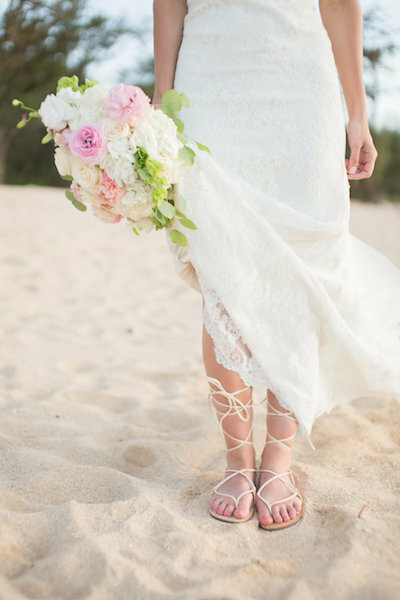 We absolutely love how Grace incorporated her father’s memory in the little details of this Maui Beach Wedding! She specifically requested a flower crown made mostly of greenery with a few dusty muted spray roses in remembrance of her father, it was his favorite flower! Not only did she look fabulous in this flower crown, but the meaning behind it is truly touching. We are also obsessed with her custom foliage bouquet and how it wasn’t too overbearing, the soft and light look created by all greenery complimented Grace’s wedding attire perfectly. This bride’s dress is easily one of our favorite wedding gowns! From the tulle skirt with floral appliques to the classy V neckline in front and back, plus little ribbons tied around her waist, this dress made Grace look, “Easy, Breezy, Beautiful”. Obviously, Gabriel agreed his bride was the most beautiful woman on the planet, he couldn’t keep his eyes off her! Exactly as it should be. With a love like their’s, we have no doubt these newlyweds will have a long and happy life together as husband and wife! 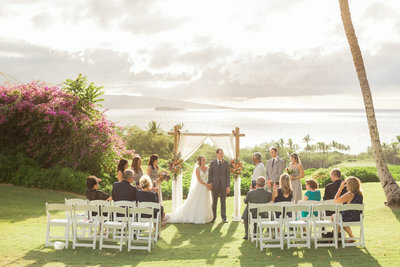 Thank you, Grace and Gabriel, for letting Simple Maui Wedding participate in celebrating your marriage! Congratulations and Warm Aloha! OMG BEAUTIFUL WEDDING @ THE BEACH! HER TO GET MARRIED. WHOLE PIC’S JUS BEAUTIFUL! AH GABE U WERE TEARY EYE.